Yesterday I attended a launch event for the OLDSMOOC – “Learning Design for a 21st Century Curriculum” – which will officially start on Thursday 10th January. There was a lot of interesting material in the talk, from Yishay Mor. At least I hope I got his name right, as I didn’t make it to the beginning and missed his introduction. However, at that I was lucky to get into to see and hear the presentation at the backup webpage. Unfortunately Cloudworks collapsed under the weight of the number of people trying to access the session and many of them did not manage to fully see and hear the presentation – a shame – but these things do happen. It’s never really possible to test that kind of mega load and a combination of technical hitches can strike anyone. Quite a few people were disappointed, as the Twitter stream and the Google Group discussions show. I was a lucky and happy bunny in the end! I was interested in the concept of teaching as a design science – there were a plethora of links which I’m going to have to dip into. I don’t entirely think that approaches like the ADDIE model of instructional design are past their sell-by date. I definitely call it learning design rather than instructional design, but adaptation of the ADDIE model is still useful as one of the tools to bring to bear on designing a new course. Of course “a new course” is not the same as “designing learning” – but in educational situations we still have to jump through some hoops for accreditation. Talking of accreditation, creating a learning opportunity that can be taken both as professional development in the MOOC tradition, as well as for credit in a particular institution, is an interesting conundrum. The types of assessment that that will require is something I might explore in this MOOC. 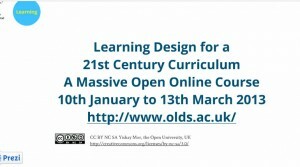 I am part of a team currently planning a MOOC and we will have to get to grips with that, as it will be both a module that can be taken for credit at two levels and a professional development opportunity. Open Badges may come into it – as they do into this MOOC. As next week I start teaching an introductory course on running synchronous online sessions, even the technical issues were interesting, for the way they were dealt with, the bitter response from some unlucky participants and the learning points. One big tip for me that came out of it was the importance of the backchannel. Twitter was the only way really to ask questions, whether about how to get in “Did you have to download Quicktime?” or “Are you having problems too?” to questions about the MOOC (I asked one about the best type of course to bring as a project to what is a very practical based MOOC) and about the topic of learning design.